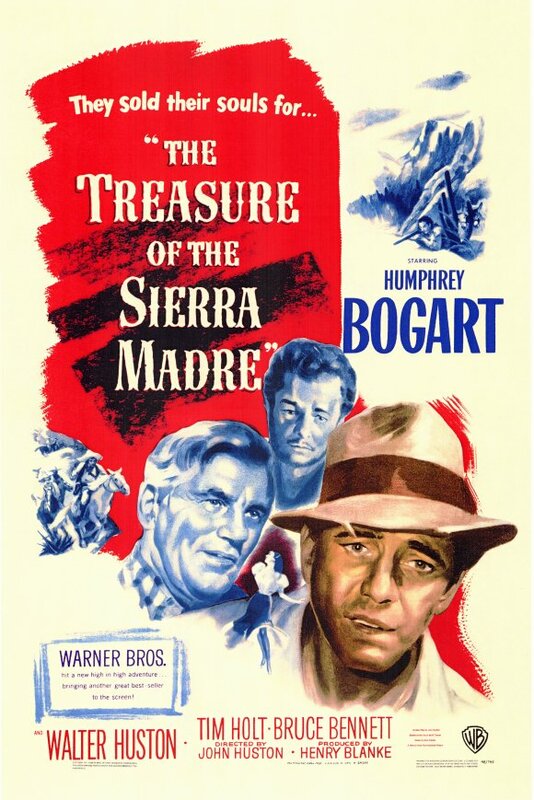 Synopsis: Fred Dobbs & Bob Curtin, two Americans searching for work in Mexico, convince an old prospector to help them mine for gold in the Sierra Madre Mountains. Did You Know? To lend authenticity to the role, Walter Huston was persuaded by his son (and director) to perform without his false teeth. Quotables: GOLD HAT: Badges? We ain’t got no badges. We don’t need no badges. I don’t have to show you any stinking badges! Humphrey Bogart is probably my favourite classic actor; he had such a gruff nonchalance to his characters. Dobbs is a poor man who still puts the welfare of others before his own. But once he starts finding gold, he becomes paranoid with greed, suspecting his fellow prospectors of treachery and swindling his claim. The film paints a grim portrait of man, avaricious and duplicitous. Dobbs tries and fails to murder Curtin, then tries to hire to bandits to help him lure both Curtin and Howard into a trap so that he can kill them and take their share of the gold. But one of the bandits kills Dobbs in a quick scene so subtle that if you’re looking away from your screen to type a thought into a review you’ll miss it.